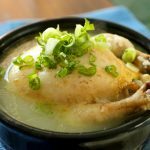 Ginseng chicken soup (in Korean, Samgyetang) is a hot, steaming, delicious dish that features a small chicken stuffed with rice, ginseng, garlic, and jujube. 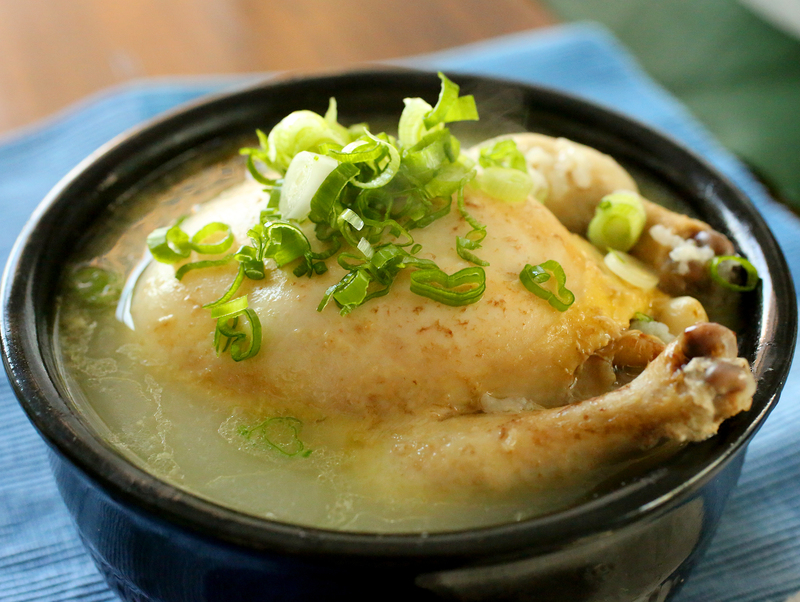 You have to commit to eating a whole chicken all by yourself when you sit down for a bowl of samgyetang! But it’s totally worth it. A while ago I ran into one of my readers in a restaurant here in New York. He was sitting at a table with his friend. We talked for a while and I asked him what his favorite recipe of mine was. He answered “Samgyetang” and told me how he often made it for himself and his mother. I was very impressed! 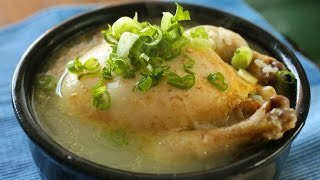 My original video for samgyetang was one of my earliest videos, made all the way back in 2007! July is a good time to remake it in HD, because Koreans traditionally eat this dish during the hottest days of summer as a way to keep up their energy and to balance their body heat with the weather outside. We have a saying: Yi yeol chi yeol (以熱治熱: 이열치열), which means “fight fire with fire.” If it’s hot outside, you have to overcome it with hot soup! Koreans designate the 3 hottest days of a year as sambok (3 bok: 삼복) and their dates vary from year to year but they usually fall in July and August. First is chobok (beginning), and then 10 days later is jungbok (middle), and 20 days after that is malbok (last). During this time, well-known samgyetang restaurants will be lined up outside, and inside they are full of diners eating hot, steamy, ginseng-infused soup, with sweat trickling down their foreheads as they fight fire with fire! Housewives make samgyetang for all her family, too. I usually prepare samgyetang and cold watermelon. After finishing hot samgyetang, finish with cold watermelon. The contrast makes your body feel shocking cold. So if you like to follow Korean tradition, you can join them in 2015 on July 13 (chobok), July 23 (jungbok), and August 12 (malbok). Let me know how it turns out! 2 cornish hens. 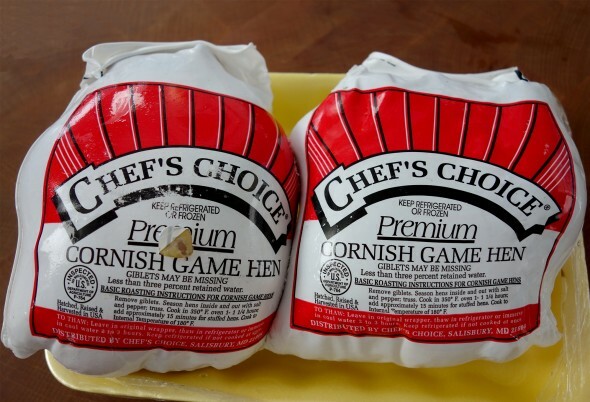 Each hen weighs about 1½ pounds, a nice portion for 1 person. ½ cup short grain rice (or glutinous rice), rinsed and soaked in cold water for 1 hour. 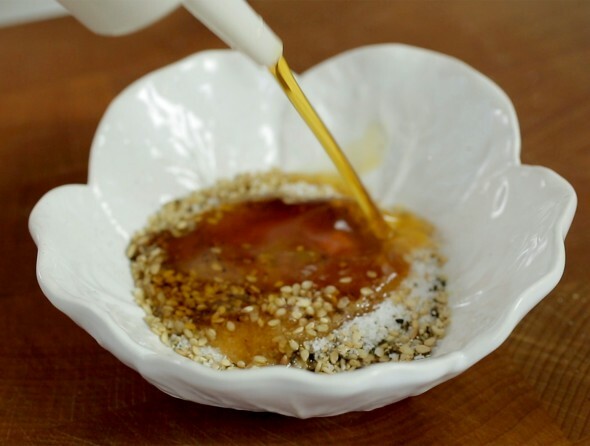 Combine salt, sesame seeds, ground black pepper, and sesame oil in a small bowl and mix well. Set aside. Combine soy sauce, vinegar, and honey (or sugar) in another bowl. Mix well with a spoon. Add onion and jalapeno. Set aside. Remove the giblets from the hens and rub them with salt all over to clean them nicely. Rinse under cold running water. Put the hens on the cutting board, pat dry, and remove any extra fat around the body cavities with kitchen scissors. Cut off the tips of wings if you want. Stuff each hen with rice, 1 ginseng, 1 jujube, and 8 garlic cloves. Put any leftover rice in the pot. Place the hens into a heavy pot. Add 8 cups of cold water, cover, and cook over medium high heat for 30 minutes. Turn down the heat to medium and cook another 40 minutes until the chicken, ginseng, and rice turn soft. Open up the pot from time to time and ladle some broth from the bottom over top of the chickens. If the broth evaporates too much, add more water. Place each hen into 2 individual bowls and add the chicken and broth. Sprinkle with chopped green onion and ground black pepper. Serve with kimchi, the 2 kinds of dipping sauce, and a small bowl of salt on the side for seasoning. If you serve them in earthenware pots, preheat the pots with a little water inside (about 2 tablespoons) and add the chicken and broth. Let them sit in on the heat until the samgyetang starts to sizzle. Then remove from the heat and sprinkle green onion over top and grind some black pepper. Serve hot with the dipping sauce, kimchi, and a small bowl of salt on the side for seasoning. Posted on Sunday, October 14th, 2007 at 9:55 pm. Last updated on July 11, 2017. Posted June 13th, 2016 at 12:34 am | Log in to reply. I need help here. I am about to buy ginseng in Seoul but I read from internet there are 3 types of ginseng – susam, baeksam, hongsam. which one of these type you use to make ginseng chicken soup above?? 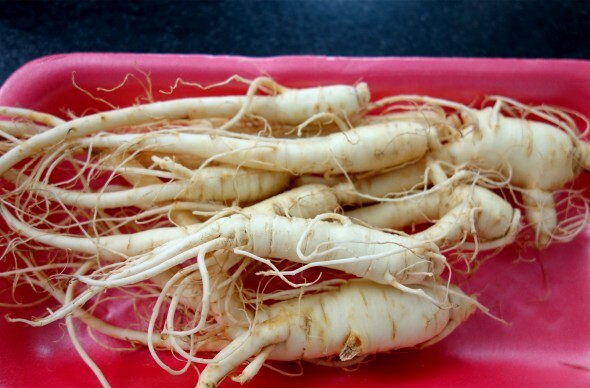 Any advise how I choose good quality ginseng? I read one of the comments I can substitute it with 1tbs ginseng powder, any recommended ginseng powder brand you have? Thank you!! Posted May 23rd, 2016 at 4:15 am | Log in to reply. Hi dear in my country just have a dried ginseng. for make 삼계탕 how many times i should ginseng soaked in water?! Posted May 23rd, 2016 at 4:13 am | Log in to reply. Hi dear in my country just dried ginseng. for make 감계탕 how many times i should ginseng soaked in water?! Posted August 13th, 2015 at 2:28 pm | Log in to reply. hi maangchi i bought this package of dried veggies but i don’t know if is good to use it to make this dish, and is yes how to use it. Posted August 25th, 2015 at 8:35 pm | Log in to reply. My assumption is going to be that it should be fine to use this but since the veggies look like they’re frozen(?) they might not taste the same. This package does say it’s for the same recipe… but I always try to go for the fresh ingredient route. Posted August 7th, 2015 at 12:03 pm | Log in to reply. I don’t have a ginseng root..can i use a ginseng powder? And how many tea spoon does i need? Thank you before..
Posted August 7th, 2015 at 12:05 pm | Log in to reply. Yes, you could use the powder, too. I think about 1 tablespoon is enough for 1 serving. Posted August 8th, 2015 at 4:05 am | Log in to reply. Thx a lot.. I will recook this recipe..
Posted April 11th, 2015 at 4:54 am | Log in to reply. Posted April 13th, 2015 at 4:39 am | Log in to reply. Posted April 13th, 2015 at 7:17 am | Log in to reply. It’s normal the color of samgyetang turns out a little dark because of ginseng and jujubes. Use less ginseng and skip jujubes (or use only 1) if you like to make yours milky. Posted October 21st, 2014 at 11:24 am | Log in to reply. Im just wondering is it necessary to have jujubes on the soap? because its hard to find jujubes here, and i really want to cook your Samgyetang,..
Posted October 22nd, 2014 at 7:00 pm | Log in to reply. You can skip jujubes and it will still turn out delicious! Posted August 25th, 2014 at 2:52 pm | Log in to reply. Posted August 26th, 2014 at 3:53 pm | Log in to reply. yes, you can. Cook it in a large stainless steel stock pot and serve it in a ceramic bowl. Posted December 6th, 2013 at 1:04 am | Log in to reply. Great video, easy to follow steps. First time making, the taste was great but not enough soup at the end and the chest meat was still not as soft as those Korean stall. The sweet rice was finger licking good. Posted August 26th, 2014 at 3:54 pm | Log in to reply. Good idea, using a large pot is better. Posted August 2nd, 2013 at 5:19 pm | Log in to reply. I found a samgyetang “kit” with the sticky rice, dried jujubes, and dried ginseng in it at our small, local Korean grocery and remembered that I always see this in my Korean cookbooks and on your site, Maangchi! Tonight I will try to make it using your recipe as guidance, since I cannot read Korean well (yet). My husband is excited to try it; maybe 어머님 will be impressed when he tells her I made it, haha! Posted August 2nd, 2013 at 8:12 pm | Log in to reply. Posted June 23rd, 2013 at 12:08 pm | Log in to reply. Posted June 24th, 2013 at 1:57 pm | Log in to reply. yes, when you eat it, add some salt to your taste. check out the step 6 in the recipe please. Posted January 15th, 2013 at 9:04 am | Log in to reply. where can I get the sweet rice? Can I just substitute with Thai’s sticky rice?? or normal rice??? Posted January 15th, 2013 at 9:21 am | Log in to reply. yes, sweet rice (glutinous rice) is sticky rice. Good luck! Posted October 29th, 2012 at 7:27 pm | Log in to reply. Hi Maangchi! Thankyou for the great recipe!! The weather has been chilly lately, and my boyfriend fell into sickness..so I was in search for a good healing soup for him and decided this was the one..~ I added some small carrot pieces and shredded the chicken and placed it back into the soup so it was easier to eat.The balance of flavours were soooo good (:. He told me this soup reminded him of his own mother’s soup! We ate it with a lot of black pepper and the garlic was soft and sweet. Yummm!!! Thank you again :)!!! Posted June 26th, 2012 at 7:03 pm | Log in to reply. I make this dish alot it’s one of my favorites and i always look forward to it, but cornish hens here are expensive and i wanted to experiment, so last night i did and it was the worst it’s ever turned out! So here is my tip: if you are using a piece of chicken instead of a Cornish hen, make-sure the skin isn’t real fatty! I used a leg last night and it turned out that the skin was so fatty that it actually ruined the soup, it ended up being disgusting! the small amount of meat i actually got was fine but the fatty skin and fatty meat ruined this dish! so if you’re trying this out use a good piece of chicken with minimal fat and a nice thin skin! lol However on a side note, I didn’t have any ginseng and couldn’t find any in my area for that time of evening, so I went to the superstore and bought ginseng tea. i used Korean ginseng tea that came in granular form. I used 3 packages and it worked really well, of course since my fatty chicken ruined my soup i’ll have to try it again!! Posted June 30th, 2012 at 9:39 am | Log in to reply. Posted July 1st, 2012 at 3:29 am | Log in to reply. Posted August 15th, 2012 at 5:49 pm | Log in to reply. LOL , here is tips for you .. next time do not use chicken thighs , why ? because chicken thighs contains the most fat . Next time , do use chicken breast , skinless , boneless , if you don’t want any fat floating around , but i must warn you , if you choose chicken breast , skinless and boneless then u must be careful , why ? because your meat might turn out pretty dry . Even cooking regular chicken noodles soup , i still end up with some fat floating around .. no biggie , don’t fuss over it , just remove it .. end of story !! Even the cornish hens still have little fat floating around !!! Posted April 14th, 2012 at 2:31 pm | Log in to reply. Great video! I love Korean Food, especially Samgyetang and kimchi chigae. Where can I purchase the pot you used in this video? What is it called? I live in Wisconsin, so I probably need to order it online. Please help! I need to make this! Posted April 14th, 2012 at 6:14 pm | Log in to reply. Posted April 15th, 2012 at 5:30 pm | Log in to reply. This recipe was originally posted on October 14, 2007 at 9:55 pm by Maangchi. It was last updated on July 11, 2017. The video was watched 2,544,231 times on YouTube & has 33,688 likes! This video is a remade version of an earlier recipe. The original video was posted on and has 0 views.